Bone health is an issue that concerns millions of people worldwide. Osteoporosis, the medical term for unhealthy and weak bones, affects up to 54 million people in the United States alone, and it is responsible for the majority of bone breakages in North America. While everybody knows about milk's benefits for bones, few people realize that there are several herbal for bone's health. Adding these five medicinal herbs to your diet can help to strengthen bones and protect against bone loss and bone damage. Lemongrass is a great herb for osteoporosis treatment support. It is rich in flavonoids, which have been found to improve bone formation in the body and prevent bone loss. It also contains fairly high levels of calcium, which is the mineral used by bones to construct new growth and repair damage. Lemongrass is popular as a seasoning, but it is also commonly drunk as a tea. Another excellent herb for bone's healing and support is horsetail. The component in horsetail that is responsible for its bone-strengthening properties is silicon. Like calcium, silicon is involved in the formation of bones. It is also thought to be helpful for maintaining connective tissues like ligaments in good shape, which contributes to bone health. Like lemongrass, it is commonly consumed as a tea, but it may also be taken as a tincture or decoction. Dandelion deserves a special place among osteoporosis natural treatments and herbs for bone health. It is chock-full of both calcium and silicon. Like horsetail, it helps the body grow healthy bones using silicon and, like lemongrass, it can improve the strength of bones by providing calcium for repair and new growth. Because of its silicon content, dandelion is also useful for connective tissue. Dandelion may be drunk as a tea or tincture. While gotu kola does not contain silicon or calcium, it has been shown to improve the health of cartilage and ligaments that connect bones. When ligaments are damaged, they can put extra stress on bones, causing bone damage. Thus, healthy ligaments are essential for healthy bones. As with the other herbs, gotu kola may be drunk in infusions or taken in capsule form. Chamomile is famous for its soothing abilities, but it also has the lesser-known ability to protect bone strength. Studies have found that chamomile is effective in preventing gradual bone loss, which is one of the leading causes of weakened bones and osteoporosis. It does this by affecting levels of estrogen, low levels of which can cause bone loss, especially during menopause. Additionally, like lemongrass, chamomile contains bone-healthy flavonoids. This herb is most famously consumed as tea, but it can also be taken as a tincture or capsules. Strong bones are essential for overall health and wellness, so bone health should be a priority for everybody. 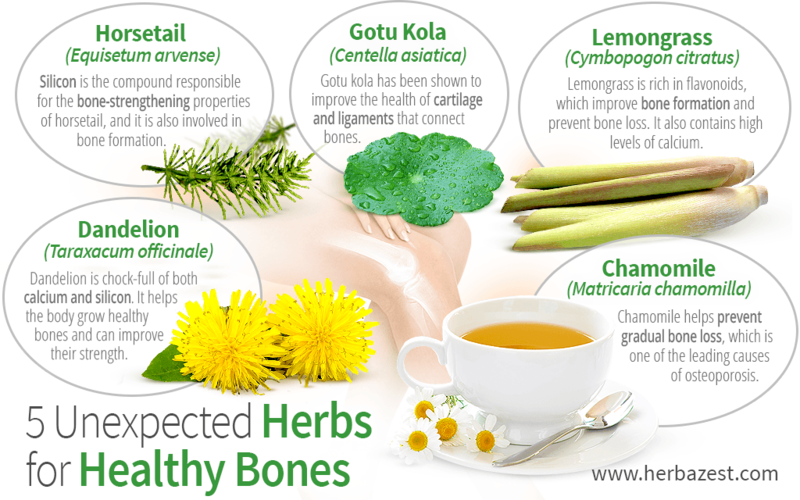 You can begin to improve your bone strength right away just by adding these herbs to your diet. National Osteoporosis Foundation, What is Osteoporosis and What Causes It?